LOS ANGELES, Calif. /California Newswire/ — Celebrated philanthropists Jane and Bert Boeckmann of Galpin Ford and the Heritage League of the Second Air Division, today announced they have joined forces again to honor WWII Veterans at the 71th Anniversary D-Day Luncheon at The Proud Bird, 11022 Aviation Blvd, in Los Angeles, on Saturday, June 6, 2015. This year the luncheon will also celebrate the 70th Anniversary of VE Day, and the 50th Anniversary of the Vietnam War. All WWII and Vietnam Veterans, as well as their friends and family, are encouraged and invited to attend. Led by Master of Ceremonies and "Glee" star, Bill A. Jones, the program includes WWII Jewish-French spy and author of Behind Enemy Lines, Marthe Cohn, among other notable dignitaries. The event commemorates the 71th anniversary of the D-Day Invasion of Normandy, when American and British forces attacked German-occupied France during World War II on June 6, 1944. Fourteen B-24 bomb groups of the Second Air Division, along with the B-17's of the First and Third Bomb Divisions of the 8th Air Force, dealt a crippling blow to the German military-industrial complex. The event also commemorates the 70th Anniversary of VE Day, marking the end of World War II, and the 50th Anniversary of the Vietnam War. For more information, and to purchase a luncheon ticket, please contact D-Day Event Chairman Peggy Learman at (818) 366-6972 or via email at whiteplains38@aol.com. 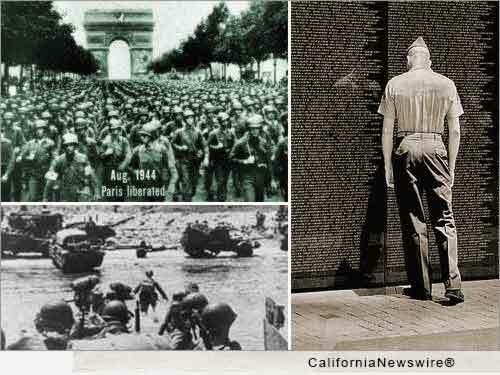 Additional information can also be found by visiting the event's website at http://www.ddayanniversaryla.com/. The Heritage League (or HL) was established in 1987 by its parent organization, the Second Air Division Association (or 2ADA). The HL mission is educating following generations about the sacrifices of our forbears of the Bomb and Fighter Group Second Air Division in WW II. We do this through informative publications, presentations, our website and a host of other social and educational programs. We actively support related efforts such as the "living legacy" Second Air Division USAAF Memorial Library, in Norwich, England, The 8th AF Historical Society, and the Mighty Eighty Air Force Heritage Museum near Savannah. Our mission is big, challenging, and exciting. We want your energy, vision and talent. The Heritage League is a 501(c)3 nonprofit org. More information: http://www.heritageleague.org/.